The MH Author Bio widget which is included in MH Magazine has been developed and designed to display a profile image as well as a brief biographical information about the particular author. Displaying a nice author bio section on your website ensures a trustworthy appearance and gives your website a personal touch. For best results it is recommended to use the MH Author Bio widget within 1/3 width widget areas on your website. This support article including video tutorial will help you use the MH Author Bio widget correctly. You’ll learn how to display a brief biographical text to inform about yourself and how to display a nice profile image using the free Gravatar service for user avatars. To place the MH Author Bio widget on your website, you simply need to navigate to Appearance => Widgets in your WordPress dashboard and put the widget into your preferred widget area. The MH Author Bio widget is most suitable for 1/3 width widget areas, for example on your front page, in the footer widget areas or within the sidebar on your website. After you’ve placed the widget into a preferred widget area, you can start adjusting the content of the widget. By default the widget title of the MH Author Bio widget displays About me, you can enter any other title which suits for your purpose. The widget was developed to display one particular author, its avatar and bio text, so you can select the preferred author from the drop-down menu within the widget options. After you’ve selected the particular author, please click the save button. To show an avatar image and biographical information within the MH Author Bio widget, please navigate to Users => Your Profile in your WordPress dashboard. You will then be referred to your WordPress user profile which contains information like the username, nickname, contact information etc. Please scroll down to the section called About Yourself and there you will find a field to enter your biographical information and you can preview your profile picture. You can enter a short bio text about yourself which will be displayed in the MH Author Bio widget accordingly. Regarding the profile picture, by default WordPress makes use of Gravatar, which is a free service where you can upload your image which always will be displayed when you take actions on WordPress websites like writing comments or displaying an author bio like in our case. If you would like to adjust your profile image, then you can register at Gravatar with the same email address you are using for your user profile on your WordPress website. You can upload an image and create your own avatar. Please also see this tutorial for a step by step guide to create user avatars with Gravatar: Using Gravatar for User Avatars in WordPress. Once you’ve completed the registration and upload of your profile image at Gravatar, you can log out again and some minutes later, the MH Author Bio widget will use this newly created avatar as profile image. Please don’t forget to save your WordPress user settings. When you take a look at the widget in the particular widget area on your website a few minutes later, it should display your bio text and your profile image from Gravatar as well. In our video tutorial, we’ve shown two examples and placed the MH Author Bio widget into different widget areas. In the first example we put the widget on top of Home 6, which is a 1/3 width widget area on your front page. In the second example we placed the widget into the Footer 1 widget area. Please watch the according video tutorial below and feel free to replicate our examples. Hello, I am using the MH Author Bio widget, yet when I click on the Gravatar it gives me an error message stating the page cannot be found. How can I link the Gravatar image in the widget to an actual about me page? There is no option to do so when utilizing the link. I also went to my actual Gravatar page and there is no option to link the Gravatar to a page from there either. Hi Liz, the MH Author Bio widget links to regular author archives in WordPress. If the author archive on your website can’t be found, then it’s very likely that you have disabled it via 3rd party plugins, for example Yoast SEO which has an option for that. That means you just need to make your author archives work again and the MH Author Bio widget will automatically link to the correct author archive. The widget doesn’t link to an about me page or else. Please also keep in mind that Gravatar is just for providing user avatars in WordPress, it doesn’t have anything to do with pages or other content on your site. 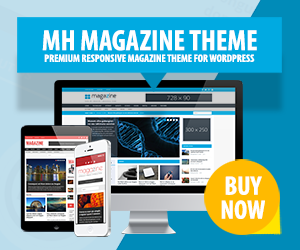 This is an additional demo of MH Magazine WordPress Theme which shows how you could use this magazine theme for websites related to fitness, health, sports, wellness, nutrition or diet. With this fancy magazine WordPress theme you can create fresh and vivid editorial sites for all kinds of topics related to healthy, vital living and lifestyle.